From Street Fighter V to League of Legends. 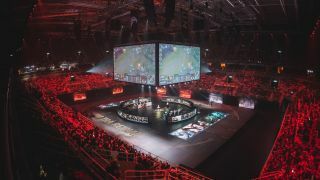 It’s another jam-packed weekend in the world of digital sports and lots of tournaments are entering their final stages. There’s plenty of action from the League of Legends EU CS Qualifiers to the Street Fighter V ELEAGUE. We even have plenty of Hearthstone tournaments to look forward to. All the details on this weekend’s events can be found below. Teams have been competing throughout the week to determine who will be promoted into the Challenger Series. The 12 teams have been separated into two groups and only the top two from each group will stand victorious. All games will be played on patch 7.10 and every champion will be enabled, so anything could happen. Reign will face Red Bulls today at 08:00 PDT / 17:00 CEST, while Euronics Gaming clash an hour later. The final four teams will meet this Sunday at 05:00 PDT / 14:00 CEST where there’ll be two best of five matches for the final showdown. The full schedule and stream can be found by heading over to watch.lolesports.com. Team Liquid won the StarLadder i-League on Sunday and now all sights are set on the Manila Masters. The Manila Masters features a $250,000 prize pool and takes place at the Mall of Asia Arena, which was previously home to ESL One Manila 2016 and The Manila Major. Day one of the tournament saw OG and Newbee smash their opponents, while Invictus Gaming and Evil Geniuses also paved their way towards the semifinals. The grand finals start Sunday at 00:05 PDT / 21:05 CEST and can be watched over on Twitch. The European and North American ECS continues today and things are starting to heat up as we near the finals. FaZe will take on Team Dignitas today at 10:00 PDT / 19:00 CEST, while G2 Esports and EnVyUS will clash at 12:00 PDT / 21:00 CEST. Faze will need to secure a win here if they wish to rival astralis for first place in the European bracket. Cloud9 remain at the top of the North American leaderboard, but SK Gaming aim to create an upset in their match today at 16:00 PDT / 01:00 CEST. Additionally, the top competitive players from CLG, SK Gaming, Immortals and Luminosity will be also be playing at Santa Ana’s Esports Arena this weekend for the ECS super weekender. The full weekend schedule and stream can be found by heading over to www.csgoleague.com. The path to the pros begins this weekend in the open division and teams will be aiming to make the leap to the HGC by competing in the Crucible. Four teams will clash to try and claim one of the two spots in the next HGC phase. Each Open Division team plays a single seven-game series against one HGC team, and the winner of each matchup either wins a seat at the HGC or defends their place. You can check out the standings for each region and view the tournament schedule for your area over on the Heroes of the Storm’s official site. Overwatch Apex Season three is well underway and Rogue will need to take down Lunatic Hai to climb the ladder of the group stage. Rogue lost 3-1 to KD Panthera in their previous match, while Lunatic Hai has continued to beat every team they have faced. The Group A match begins today at 03:00 PDT / 12:00 CEST, while the Group B match between X6 and RunAway starts at 04:30 PDT / 13:30 CEST. Make sure to check out the full stream over on Twitch. The Hearthstone Global Games tournament enters week seven of play today and every team has been fighting hard to claim the top spot in the group stage. Group F’s round four match concluded yesterday for US viewers, but those of you in Europe can catch all the action today at 03:30 CEST. Canada are off to the best start in Group F with nine total wins and only one loss, however, it’s a long road ahead for the pros and every team will be fighting hard to secure the $300,000 prize pool. The full schedule and stream for week four can be found here. The Americas Spring Playoffs take place this weekend and plenty of familiar faces will be competing. A quick look at the standings shows that muzzy is at the top of leaderboard followed by Astrogation and zalae. However, only eight of best players from the Spring Tavern Hero Tournaments will join their region's top 64 players to compete for one of four spots in the Spring Championship. Players will also be competing for a share of the $25,000 prize pool, so expect the competition to be tense. The playoffs will be broadcast live on the official Hearthstone Twitch channel and start Saturday at 08:00 PDT / 17:00 CEST. The Hearthstone action doesn’t stop there as players have been busy climbing the rankings in this year’s StarLadder. Currently, neirea remains on top of the Group A standings, while zalae and Rdu are tied for first place in the Group B bracket. The series uses the best of 5 "conquest" format and every player will be looking to secure the lion’s share of the $30,000 prize pool and the SL title. The schedule and stream can be viewed over on starladder.com. The group playoffs of the Street Fighter V ELEAGUE is kicking off tonight’s action and with the grand finals just around the corner the competition has never been so fierce. Punk and Fuudo are the current favourites of the tournament and are expected to play in the final. However, Punk destroyed Fuudo at the Capcom Pro Tour Northern California Regionals and he will be looking to take him down once again. Fuudo certainly won’t go down without a fight, as his ability to punish his opponents missed attacks makes him extremely dangerous. The full schedule and stream can be found by heading over to www.eleague.com.